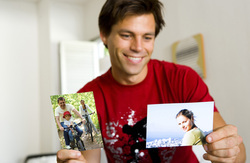 Reprints are great for sharing holiday shots with friends and family and for sending to relatives overseas. Even if you don't have the negative for an old or favourite photo, we can produce high quality black & white or colour prints from your original photo. We can also produce a re-print of an old, damaged photo by first restoring the image back to its former glory and then printing a copy for you. Your photos can also be reduced or enlarged to the perfect size from your original photo to fit into your photo album or for displaying in a particular frame. Just remember, however many prints you get made, you always get your original back!